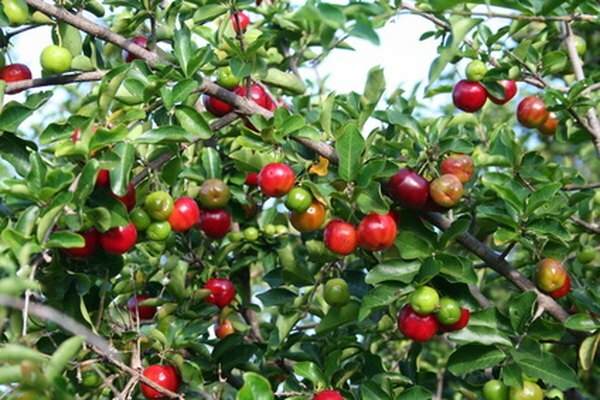 Also referred to as a Puerto Rican cherry, Antilles cherry, West Indian cherry and Barbados cherry, acerola cherry makes a welcome addition to any health-conscious diet. The cherry is produced on a small shrub that grows throughout South America, Central America and the southern United States. No matter what you call the acerola cherry, you can reap the health benefits associated with its nutrient content. Acerola cherries contain more vitamin C than other fruits. One cup of acerola cherries contains 1,644 millirams, or 2,740 percent of the recommended daily intake. In contrast, an orange provides just short of 100 milligrams. Vitamin C helps you form strong collagen, skin, blood vessels and muscles, helps heal wounds and keeps bones and teeth healthy. Vitamin C is not stored in the body, which means it needs to be replaced daily. For this reason the National Institutes of Health recommends regularly consuming foods high in vitamin C content. A small serving of acerola cherries, or drinking some pure acerola cherry juice, will more than suffice for your daily vitamin C needs. Antioxidants fight free radical damage -- damage that occurs on a molecular level, and contributes to disease. When free radicals react with chemicals in your tissues, they cause damage to healthy cells, which leads to problems such as premature aging, inflammation and diseases. Acerolas offer antioxidant benefits thanks to vitamin C. However, they also contain compounds called anthocyanins, which are also found to have antioxidant properties, according to the 2007 issue of the Journal of Agricultural and Food Chemistry. Anthocyanins help lower the risk of heart disease, enhance memory function, protect developing fetal brain tissue, act as an anti-inflammatory, help regulate blood sugar and reduce the risks and effects of obesity. The beneficial properties of the acerola cherry extend to the outside of the body. Numerous products on the market contain acerola extract. Its high vitamin C content of the cherries helps form collagen, the building block of healthy skin that keeps it toned and youthful in appearance. The anthocyanins help prevent inflammation in outer skin tissues, just as they do on the inside of the body. Internal consumption of acerola extract can also have cosmetic uses, as a study in the December 2008 issue of Bioscience, Biotechnology and Biochemistry reports that acerola can suppress the synthesis of melanin, which gives the skin a "lightening" effect.